The Presidents of the United States of America re-band and up their number of studio albums to four. Is this a good thing? Well, that depends on whether you missed PUSA or not. If you, and I imagine there truly are a few of you out there, have been spending your days wondering when your favorite Seattle fun-rock trio might pop their heads out from below the clouds and deliver you new tunes, then you are in luck. 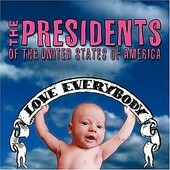 Love Everybody is a PUSA album. It's catchy, funny, sometimes clever, and destined to have you tapping your feet and bobbing your head. The first two tracks, "Love Everybody" and "Some Postman" are standard issue Presidents. The rest of the album isn't much different, but certainly not all "Lump" and "Peaches". If, of course, like me, your musical tastes have changed or broadened anytime in the last five to ten years, then you may be mildly disappointed. Actually, for you, this release may completely pass you by unnoticed. What I'm trying to get at is, if you are a PUSA fan, this album is a B+ and you'll be delighted from the second you hit play. If you were a PUSA fan, but haven't played a disc of theirs for a few days/months/years, you might want to give one of the old ones a spin before deciding if you still want to invest your brain cells on this album.